Skype  has been around since 2003, and Microsoft took over the service in 2011. The free program supports instant messaging, IP telephony, video conferencing, data transmission, and screen sharing. Skype versions for Android, iOS, and Windows Phone are also available. Even though Skype uses a proprietary protocol, and it is not considered secure, it has remained the leading IM and telephony solution for many users, partly because it is available for all major operating systems and platforms. Linux users, however, have been out in the cold since 2014. The last version of Skype that runs on Linux (Skype 4.3 for Linux) only supported 32-bit architectures, and many Linux users experienced problems getting it to work consistently. Skype 4.3 for Linux installed on many Linux distributions with a modicum of effort, but it was missing important features such as video conferencing. On July 13 of this year, Microsoft announced a new alpha version for the Linux desktop in a blog post . Microsoft's newfound affection for Linux was evident in the announcement, which stated, "This release reaffirms our commitment to an important group of people – the Linux community." Version 1.2.0.1 of Skype for Linux is still in an early stage of development. Many features haven't been implemented yet, but you can already experience some important improvements, such as a faster and more feature-rich Skype UI. Microsoft says it released the alpha version to get feedback from the community, so we decided to start it up and try it. We tested the new Linux client on Ubuntu 16.04 (Unity) and openSUSE Leap 42.1 (KDE Plasma), and we also phone-called Windows, OS X, and iPhone users. Microsoft says it will release a new version of the alpha prerelease every two weeks, so by the time you read this article, new versions might already be available that address some of the issues highlighted in this article. Debian and RPM packages are available in the download section, each for 64-bit systems . During installation, both packages create a new repository named skype-stable  and resolve various dependencies, including adding the Gnome Keyring (gnome-keyring) package if it is not already installed. Skype does not work with KWallet or other password managers. After you launch skypeforlinux, enter your access details, or create a new user account by selecting Create new account. Although the software is nicely localized for other platforms, as things stand now, the alpha version of the Linux edition only speaks English. As usual, clicking on your avatar top left takes you to your account settings, where you can change your profile picture, status, or add a personal message. Windows and OS X clients provide many more options, allowing you to enter phone numbers, location details, email addresses, gender, and date of birth. In the alpha version of the Linux client, you can only configure audio and video devices during an ongoing conversation via the gear icon in the main window. History, contacts, the Skype configuration, and a button for new conversations are accessible in the left sidebar. You can search for other Skype users and contact them using Search Skype. Our test of the search feature yielded some varied results; some requests succeeded in finding users, and others did not. For testing purposes, our team confirmed contact on OS X and hoped that the Linux client would accept the information. Synchronization succeeded, but only after restarting Skype. Instant messaging already runs smoothly between two users or a group of users, and the (sometimes rather annoying) Skype emoticons are available for Linux users. In one-to-one chats, clicking the globe calls Skype Translator, which can translate into over 50 languages. Functions that scored well in the test include a feature that shows whether the other person is typing (if the other person has allowed that information), along with data transfer, contact sharing, and invitations to chat. The Linux client failed to play video messages, showing just a thumbnail. 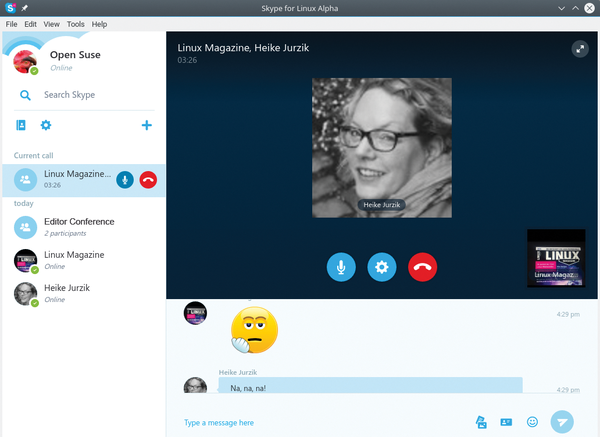 The alpha version of Skype for Linux dropped a few simple phone calls. Although discussions from Linux with iOS and OS X users worked, the microphones often remained mute for calls between Linux and Windows clients. The testers repeatedly saw the missed call (Linux) and sorry, we couldn't connect (Windows) messages. Occasionally, it was actually possible to leave a voice message. An audio conference between two Linux clients and the iOS user proceeded without any problems (Figure 1). In the alpha version, it is no longer possible to add contacts to an ongoing conversation session; users must first create the group and then begin the call. Figure 1: The test team in the audio conference: The avatar of the user currently speaking appears highlighted in the main window. Some of the planned features have not yet been implemented in the alpha version. In addition to video calls and conferences, these features include screen sharing, calls and text messages to a landline or cellular network, and an option for managing your Skype credit balance. Those functions are likely to make their entrance quite soon, with a new release appearing every two weeks . The updates should be available in package form; see the announcements and discussions at the Skype Community site for more information . If you like, you can leave feedback for the Skype programmers and include your machine's logfiles by enabling debugging mode with the [CTRL]+[Shift]+[ALT]+[D] key combination (Figure 2). If you are interested in getting in touch with the creators, leave a message through the Help | Feedback menu item, or use the #skypefeedback hashtag on Twitter. 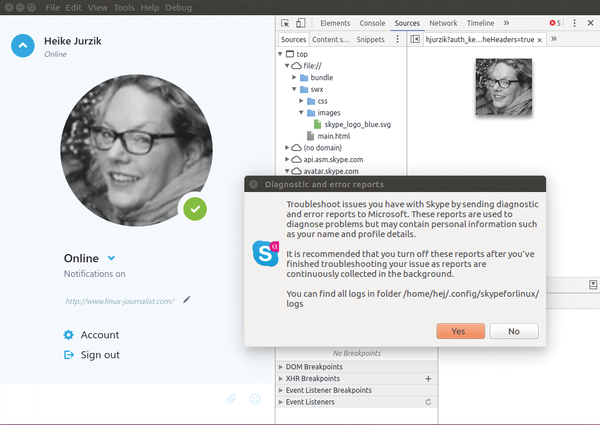 Figure 2: You can turn on debugging mode and logging for all Skype messages from the Debug menu.